I've been dreaming of visiting the Smoky Mountains ever since I first heard Dolly sing "In my Tennessee mountain home..." but none of the songs really do justice to their scale or beauty. We picked up our rental car and wound our way into the mountains. It felt a little like standing on top of the world. 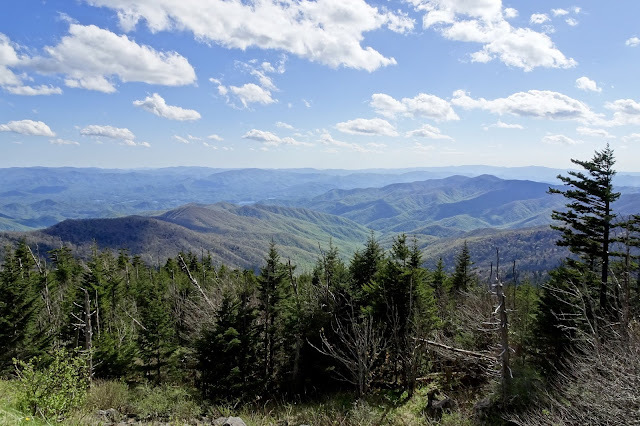 When I could finally tear myself away from that view, we headed back down the mountain and made our way to the edge of the Smokies - to Maggie Valley and Cataloochee Ranch. When we arrived at the ranch, our lovely hosts fed us enough to put us into a food coma. We awoke the next day to this beautiful view. After another feast for breakfast, we decide to spend the morning exploring Mingo Falls. I have been lucky enough to visit some of the most spectacular waterfalls in the world on my travels, and while these didn't quite match the scale of others, they were by far the prettiest.